Last weekend me and a few friends celebrated Oktoberfest in Gothenburg. Not October (or even September), and no Bavarian Helles, but we somehow managed to drink a truly heroic number of maß anyway. The hosen were on, and the Sunday hangover were far from slight. It gave me some fond memories of Starkbierfest in Munich, and the day after when I first went to Regensburg to play oldschool magic with Martin and Alex. 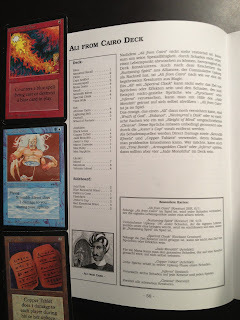 I guess it's high time to return to the sweet books I got from them, and delve into the Ali from Cairo deck. This deck was presumably built around late 1995, but apart from Jester's Cap and the 4-off Mana Drain the list is legal in 93/94. Cutting the Cap is not a huge loss for the strategy, and Mana Drain is mainly a powerful value spell here and can be replaced. I must say I really like this deck! The idea of abusing Ali with Copper Tablet, and protecting him with Jade Monolith and Spectral Cloak is very nice. There are some obvious updates that can be made here though. Playing only 17 lands, not playing Sol Ring, and including the Fireballs seems a little random. If I owned the cards for the deck, it's most definitely something I would start teching with though. Green for Avoid Fate maybe? Avoid Fate seems fine, and you can use Birds of Paradise to fix mana and speed up your mana production. Black Vise seems like a strong inclusion too, and sometimes just wins on its own. A black splash could be strong too, especially utilizing Warp Artifact or Underworld Dreams if we are on the Copper Tablet plan! Demonic Tutor is another strong way to find Ali or a protection piece while Animate Dead can bring Ali back from some more action. Yeah, there are definitely lots of nice possibilities here. Armageddon Clock is pretty cool as well, and Ifh-Biff Efreet would be nice if the deck played green :) Another approach could be to just jam 8 bolts, 4 psiblast, detonates and copper tablets (and maybe electric eels) and go more aggresive with the burn. That would possibly help to battle City in a Bottle. What is the book title? I used to own this book back in the days but forgot the name.